with Clyde Smith Jr., "The Cub Doctor"
Attendees of the Fall 2010 Fabric Piper Seminar with The Cub Doctor, Clyde Smith, Jr. A great 3-days of Piper rag-wing discussion and education!! 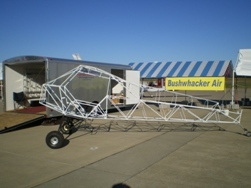 Bushwhacker Aircraft at the Midwest LSA Expo in Mt. Vernon, Illinois. Special thanks to Alaskan Bushwheel for the use of the tires and wheels! Bushwhacker Aircraft Company, LLC, offers Experimental and Light Sport Aircraft Wide-Body Fuselages, Wings, Parts and Components for the Piper PA-18 SuperCub, J-3 Cub and their variants. We are currently creating a PA-18/J3/Clipped Wing Cub variation, the BushCub Sportsman. It will be powered by the Lycoming O-235/IO-233, offering the most power in its Light Sport Aircraft class. Our BushCub Sport J-3 Fuselage is an exact copy of the legendary Piper J-3. Mods such as PA-18 Seats and windows can be added. PMA approval is pending. The BushCub XP - our "1-Ton+" Cub Variant, in an Experimental Kit. Fully Welded Fuselages now available in both models. 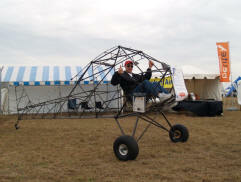 Latest News: 9/21/2010 - Bushwhacker Air was at the Midwest LSA Show in Mt. Vernon, IL. The Second Annual Midwest LSA Show was a great place to be at the end of September. Met a lot of nice folks - Thanks for stopping by and providing the positive feedback on the BushCub. Now Offered from Bushwhacker Aircraft Company- J3 style fuselages with PA-18 seating, window and baggage. Check out our new BushCub Sport J-3 Fuse - built like the original Piper J-3, not the SuperCub PA-18. Same size tubing, only 4130 through-out. Uses J-3 all parts, including wings. Click here for more photos on Facebook. Thanks to all that stopped in and complimented us on our fuse and wings. We fielded a lot of questions, but not one of our visitor's questioned our quality! Hope you can all make it to Sun-N-Fun to see our progress. Copyright © 2010 Bushwhacker Aircraft Company, LLC All Rights Reserved.